Europe was not able to recognize the problems what Turkish President Recep Tayyip Erdoğan faced during the last month's coup attempt, said Thorbjørn Jagland, the Secretary General of the Council of Europe (CoE). 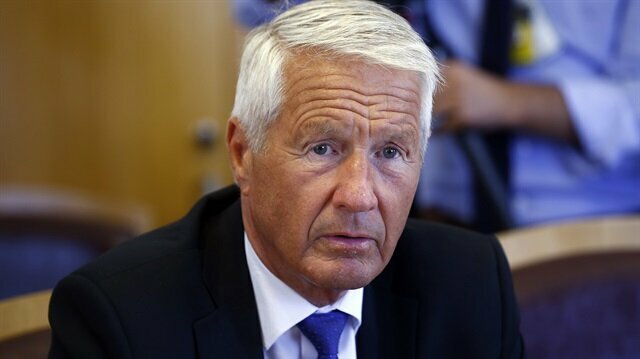 Jagland noted in an article published by the Norwegian Klassekampen newspaper that he told EU ministers about “an unpleasant truth" that Turks were “outraged and angry" over the EU leaders' attitude after the failed coup. Jagland was the first EU official who visited Ankara weeks after the coup attempt as Turkish officials repeatedly said they had expected to see some EU diplomats in Ankara immediately after the coup that killed 240 people on July 15. He admitted that the European leaders' stance against President Erdoğan instead of supporting him was a great mistake. “When I submitted a report to the Committee of Ministers of the Council of Europe after a visit to Turkey last week, I had to tell the unpleasant truth -about how outraged and annoyed Turks were on those whom they called "the Europeans", because of the EU leaders' late condemnation of the failed coup," Jagland writes. He said that Turkish political representatives, both from government and opposition sides, blamed Europe for not showing the same solidarity as they showed after the attack on Charlie Hebdo and other terror attacks in Europe. “Following the Charlie Hebdo attack, that killed 12 people, all European leaders rushed to Paris in solidarity with France," he added, quoting Turkish political representatives. He said that Turks reminded him that after all other recent terrorist attacks in Europe, the EU leaders had said: “This was an attack on all of us." “But why did not we [EU leaders] unite [to support Turkey]? Why did no one say that it was an attack on all of us?" Turkish leaders were outraged, according to Jagland. He admitted that Europe made a mistake to run behind the conspirators who claimed the coup attempt was Erdoğan's theater. “The putschists used the government's tanks for shooting people, f-16s for bombing the parliament, presidential palace and the police headquarters, soldiers were sent to kill the president, prime minister and foreign minister," he explained what exactly happened on the coup night. “Despite such facts, a suspicion was speared in Europe that the coup was staged by Erdoğan himself," he said, adding Carl Bildt's quote, “Has Europe slept?" He suggested that Europe should follow local Turkish newspapers to understand what really is going on in Turkey, rather than lending an ear to suspicions. “If the press wants to reflect on what is happening in Turkey, it is enough to read [local newspapers]. There are still many independent newspapers there," Jagland wrote, giving example of some independent Turkish journalists like Ezgi Başaran and Mustafa Akyol, who also lashed out at Europe for a lack of understanding Turkey's current situation. Ezgi believes that Europe has not understood that there is a secret network in the Turkish public institutions, as the coup attempt has shown how dangerous it is, she noted. “She wrote that it was revealed long before the coup attempt that the secret network was a big problem for democracy in Turkey. But the Europeans have refused to take it seriously, because people claimed Erdoğan for the coup," Jagland said adding that Europe should listen to journalists like her. He also cited an interview of the British ambassador in Ankara with the Hurriyet Daily News. “He [British ambassador] knows Turkey well and speaks the Turkish language. He says that the Gülen network exists and it is dangerous. He even said that Gülen himself, perhaps, was behind the coup," Jagland noted. He also described the Gülenists' recruitment process and compared it with the history of Pakistani madrasas that provide education and housing to the children of poor parents. “The goal was to get them into particular positions in defense and judiciary," he emphasized. The Gülen network has managed to station its elements in recruiting units of state institutions as public service, police and military schools examination boards, he continued. “Pupils of such schools received the question papers in advance and could easily win the competition. They only obeyed the orders from their big brothers in the network," he said. Jagland also highlighted that Gülenists had sabotaged the Turkish peace process with the outlawed Kurdistan Workers Party (PKK) by bugging the conversations between Erdoğan's envoys and the PKK that began in Oslo. “The purpose was to destroy the negotiations and prosecute Erdoğan," he said. Jagland noted that the failed coup attempt could be a beginning for a new Turkey suggesting that Europe should take sides with this new process with credibility. “Such credibility can only be based on the recognition that the coup was carried out by the dark forces of the Turkish state, and that Turkey has the right to clean it up," the CoE leader said.